New Delhi: Society of Automobile Manufacturers (SIAM) kick-starts the Road Safety Week campaign today at India Gate. 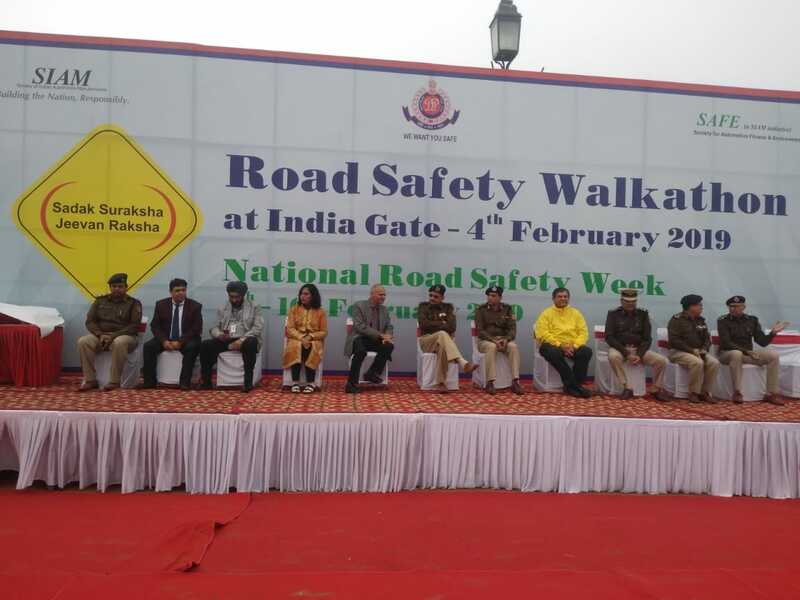 This year’s event on the theme “Sadak Suraksha – Jeevan Raksha” has been organized in association with the Ministry of Road Transport and Highways, Government of India (MoRTH) and Delhi Traffic Police. SIAM also launched the Indian Automobile Industry’s initiative of declaring 2019-2020 as National Road Safety Year in presence of Mr. Nitin Gadkari, Hon’ble Minister of Road Transport & Highways, Shipping and Water Resources, River Development & Ganga Rejuvenation, Government of India and Mrs. Sushma Swaraj, Hon’ble Minister of External Affairs of India. After the launch of SIAM Initiative of 2019-2020 as National Road Safety Year for Indian Automobile Industry, the Hon’ble Ministers flagged off a motor rally to commemorate 150th Birth Anniversary of Mahatma Gandhi. Supported by Kanishka Sports and Mahindra and Mahindra, the rally starting from Rajghat is scheduled to conclude in 22 days covering 7250 kilometers. “It’s important to follow Gandhiji’s principles of peace, patience and tolerance in the case of road safety as well. Else whatever steps are taken or rules created, the situation of road rage, careless driving and accident scenarios won’t change.” Said, Smt. Sushma Swaraj.